As the word “start” boomed from the speakers, hundreds of women lurched forwards toward the starting line of the Red Dress Run. At the beginning of the race, the 90 degree heat didn’t phase the many runners. Women were moving swiftly past the starting line and through the beautiful park setting. I passed the many multicolored roses in bloom, but I was more focused more on my pace, which was slow, but steady. This was, after all, my first week of returning to running. A few years back I ran frequently, nearly everyday. There wasn’t a situation that could stop me. I ran in the rain, heat, and the cold. Then, winter happened and it was too cold for me. As I hibernated inside with a cozy blanket, I got away from exercising and running. Years have passed and I have run on and off (mostly off), but I’m happy to be running again. I haven’t felt this good about myself in a long time. Running is action. I like that I’m finally moving again. I’m working towards a goal and becoming healthier. I finished in the middle of the group, but for me, it was more about finishing than my race time. After a session of cramming in runs all week to try to prepare (as I found out about the race late and wanted to participate), I ran across the finish line wearing a smile. I was tired and hot, but mostly, I felt good. Running felt right. Running something I want to keep as a part my life and in my daily routine, just like cooking (which I love). 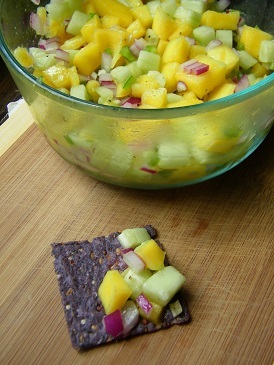 On July 4th I decided to experiment with a mango to make a refreshing salsa for a family pool party I was invited to attend. 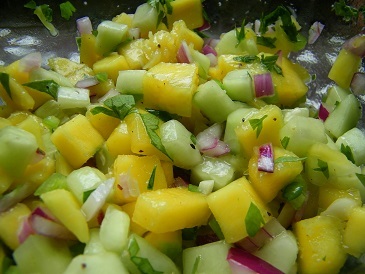 In one bite I tasted the flavors of the cooling cucumber, the spicy diced jalapeno, the mango which was slightly sweet, and the lemon juice and olive oil which tied the flavors in the fresh salsa together. *Another possible addition to this salsa could be an avocado, which would add a creamy texture. After dicing all of the veggies and fruits (not too large), then combine them in a mixing bowl. Mix the ingredients including the parsley and garlic. Then add the lemon juice, olive oil, and spices. Mix again and let sit in the fridge until serving (the longer it sits the more the flavors will blend together). Serve after about 15-30 minutes of chilling. Enjoy!